If you roll over the image, you should see the note that was included with the comic on the site. 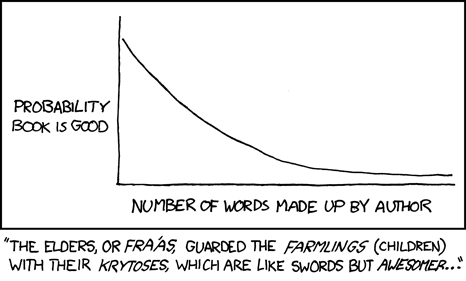 It says, "Except for anything by Lewis Carroll or Tolkien, you get five made-up words per story. I'm looking at you, Anathem." The probability curve above demonstrates my concern. I do remember seeing a comment from Kyle Haight somewhere, and I think he said he liked Anathem. Kyle, if you read this, post a comment and let me know what you thought of the book. In the meantime, I will continue to read and greatly enjoy The Fountainhead. I can't remember the last time I read it, but it was at least 5 years ago. Damn, what an amazing book. I enjoyed it, but I have a fairly high tolerance for Stephenson's writing. As with much of his work, it could have used some more editing. The made-up words just served to move me into the world of the story. The aspect of the book that I enjoyed was the way Stephenson set up a whole parallel "intellectual tradition" that was grappling with the same issues facing philosophers in reality, without just doing a simple one-to-one mapping. It's an impressive accomplishment from that standpoint, even though his perspective on the philosophical issues is a fairly conventional one. Thanks Kyle. I have a high tolerance for Stephenson too, and I was definitely intrigued by the philosophical aspects of what it sounds like he's trying with Anathem. I was mildly concerned that he had gone off the deep end, but it sounds like he didn't. "It's an impressive accomplishment from that standpoint, even though his perspective on the philosophical issues is a fairly conventional one." That was one of my issues with the trilogy. I was very happy that he acknowledged the importance of ideas in shaping the world, but his actual view of philosophy itself is conventional (i.e. wrong).